Our firm provides expert advice regarding Canada investor visas to help you decide on the right path for your business. After a comprehensive consultation, we make recommendations, provide a strategic action plan and represent you throughout the process. Let us help plan your future in Canada. Rosenblatt’s innovative WP2PR program is truly ingenious. I was able to buy a business, get a work permit and get Canadian immigration status. Buy or start a business and get Permanent Residence quickly. 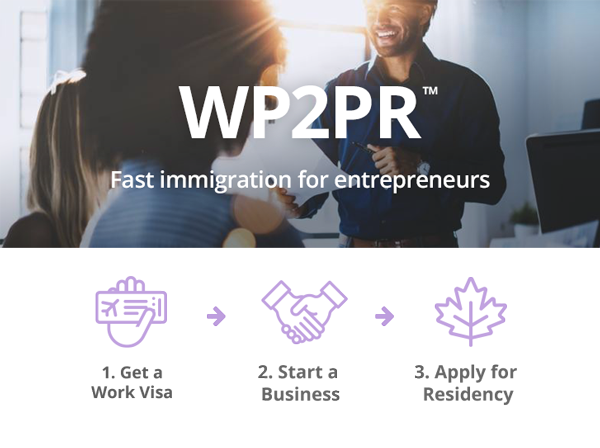 WP2PR is a fast and smart way to immigrate to Canada. Our system can take you from a business owner to a permanent resident in a matter of months. No minimum net worth is required, just the financial ability to start a business. Business visas and work permit arranged in as little as a month. We help you buy or start a suitable business in Canada. Eligible investors can get permanent residence within 6 months. Functional English capability is usually required. Canada is a safe, stable and growing country and rated one of the best places to conduct business. Below is a brief summary of the Canadian immigration programs for entrepreneurs, investors, and self-employed people. Please contact us for our expert advice and recommendations in selecting the right program for you. The Start-Up Investor Visa Program is a newly launched initiative to attract world-class innovators to Canada. Entrepreneurs can qualify for permanent residence if sponsored by a venture fund, business accelerator or business incubator. If your start-up is financed or developed by a designated institution, you will be able to obtain a letter of support for permanent residence. Self-Employed applicants must have at least 2 years (out of the last 5) of relevant experience plus have the intention and ability to become self-employed in Canada and make a significant contribution to specified economic activities in Canada. Although there are no minimum financial requirements, an applicant’s financial assets are important to show intent and ability to establish economically in Canada. Applicants must have sufficient funds to create an employment opportunity for themselves and maintain themselves and their family members. They must prove they have been able to support themselves and their family through their talents and would be likely to continue to do so in Canada. This includes the ability to be self-supporting until the self-employment has been created. Canada’s central provinces offer agricultural business programs allowing farm owners and operators to expand their business into Canada. Operating capital and an exploratory trip is usually required. As with the generalized provincial entrepreneur programs, these programs generally require intent to reside in the province of application, with a refundable sum forfeited to the province if the applicant does not remain in the province. Entrepreneurs selected by BC must first sign a business performance agreement and then obtain a work permit so they can start a business before being nominated for permanent residence. The BC PNP EI Regional Pilot targets entrepreneurs wishing to start a new business, settle in regional centres, and contribute to the local economies of those communities. The personal net worth and investment criteria is reduced to reflect the lower costs to start a business and settle in these communities. Successful candidates will be granted a WP and the BC PNP will issue a nomination for PR after the business meets all the criteria outlined in its Performance Agreement. All candidates receive a score upon registering. The highest scoring candidates will be invited to submit a full application to the BC PNP on a monthly basis. Registration for the pilot will open in early 2019 for an initial period of two years. Selected applicants must sign a performance agreement first and once they meet the terms they can get nominated for permanent residence. Applicants are assessed according to a point grid. Applicants who meet the basic requirements are scored according to a point grid and other factors. Selected applicants must first sign a business performance agreement and pay a $100,000 deposit. Applicants can receive their nomination (which is used to apply for permanent residence) before they fulfill the terms of the performance agreement. Priority Sectors: Information and communications technologies, financial services and insurance, contact centres/back office operations, health and life sciences, professional services, food processing, value-added wood, aerospace and defence, advanced manufacturing, agriculture, tourism. For recent foreign graduates who studied at least two years from a recognized university or college in New Brunswick. Applicants must have subsequently started or acquired a business in New Brunswick and operated it for at least one year while on a  Post-Graduation Work Permit. Entrepreneurs selected by NWT must first sign a business performance agreement and then obtain a work permit so they can start a business before being nominated for permanent residence. This Program requires applicants to file an Expression of Interest (EOI) and approves applicants based on a point grid and other factors. Entrepreneurs must buy, start, or invest in a business and meet the terms of a business performance agreement before being nominated for permanent residence. Entrepreneurs selected by Ontario first sign a business performance agreement and then obtain a work permit so they can start a business before being nominated for permanent residence. The PEI Government has recently closed the Provincial Nominee Program entrepreneur stream as of September 20, 2018. PEI no longer accepts applications from immigrants looking to set up a business in exchange for immediate permanent residency. Entrepreneur immigrants may now apply through the Work Permit stream. Applicants would move to PEI and run an operational business for one year before being nominated and receiving permanent residency. All candidates will continue to be invited through the Expression of Interest system and the draw schedule will remain unchanged. Applicants get Canadian permanent residence through Quebec and start a business after landing. For at least 1 of 3 years following settlement in Canada, the applicant must participate in the day-to-day operations of a Quebec business, valued at a minimum of $100,000, which they have created or acquired. Entrepreneurs approved for the following provinces must sign a business performance agreement, obtain a work permit and fulfill conditions before being nominated for permanent residence. They generally require demonstrated intent to reside in the province, with a refundable sum forfeited to the province if the applicant does not satisfy this requirement. Canada’s only passive investment program, re-opened September 2018. Entrepreneurs selected by Saskatchewan must first sign a business performance agreement and then obtain a work permit so they can start a business before being nominated for permanent residence. Entrepreneurs selected by Yukon must first sign a business performance agreement and then obtain a work permit so they can start a business before being nominated for permanent residence.